Home > Operations > How do I use delivery zones? Delivery zones can be used to designate which countries you are willing to ship to, as well as to set different shipping rates for different regions. To configure delivery zones, navigate to Operations → Delivery zones. By default, only the country in which an account is registered is enabled and placed in its own zone. 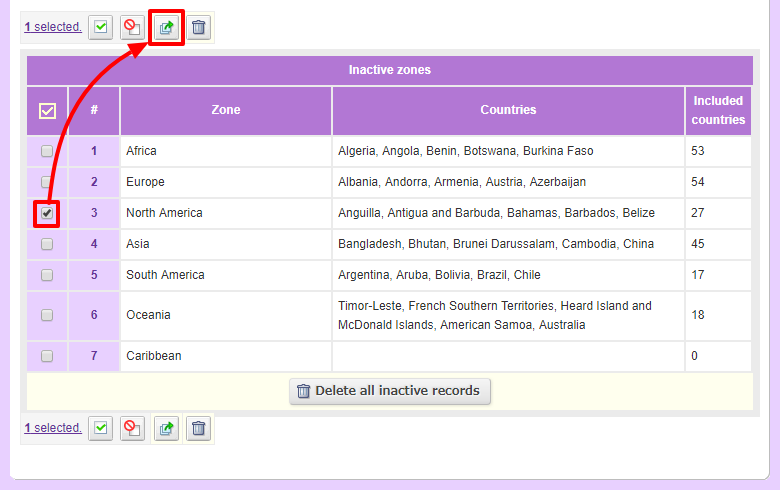 To enable other zones, select the zones you wish to enable in the Inactive zones table and click the (Restore) button. Countries can be moved in and out of zones. To simply remove countries from a zone, click the (Edit) button in the Action column for the zone you wish to remove countries from. On this page, click the (Delete) icon in the Action column to remove a country from that zone. When you're done removing countries, click (Save). Removed countries will become unzoned, and will be disabled in customer billing and shipping addresses. To add countries to a zone, click the (country list) button at the top of the Delivery zones page. New zones can also be created. To do so, click (Add zone) on the main Delivery zones page. Enter the new zone name in the Zone field and select countries you wish to add by selecting them in the Countries field dropdown menu and clicking (Add). When adding large numbers of countries to a zone, it may be easier to use the (country list) page discussed above. When shipping methods are set to Shipping rate by zone and shipping fees for a zone are unspecified, countries in that zone cannot be selected for shipping addresses. When creating new zones after shipping methods have already been set up, please take care to add shipping rates for new zones.